Dated February 8, 1915 in Washington, D.C.
At the time James C. McReynolds signed this card on February 8, 1915 he had been on the Supreme Court five months and he stayed on the Court until February, 1941, a longevity assisted by his hatred of Franklin D. Roosevelt who he did not wish to give the opportunity to appoint another liberal judge. McReynolds was President Woodrow Wilson's first Attorney General and Wilson selected him as his first nominee to the Supreme Court. If Wikipedia is to be believed McReynolds was, like Wilson, a racist and bigot, who loved children but hated the rest of mankind. In judicial philosophy The Oxford Companion to the Supreme Court describes McReynolds as a "staunch conservative" who "believed that the Constitution fairly committed the nation to a policy of laissez-faire capitalism" and thus voted against the expansion of the federal regulatory state, especially the New Deal of Franklin D. Roosevelt. McReynolds was in the majority on the Court until Roosevelt's 1937 court packing scheme scared Chief Justice Charles Evans Hughes and Justice Owen Roberts into shifting sides to join the liberals. Thereafter the political and legal philosophy of the the liberals has held sway and federalism and the traditional constitutional role of the states has been obliterated by an expansive interpretation of the "commerce clause." But in 1915 when McReynolds signed this card the Supreme Court still believed in the wisdom of the Founders in 1787 and adhered to the common sense meaning of the words in the Constitution and its Amendments. 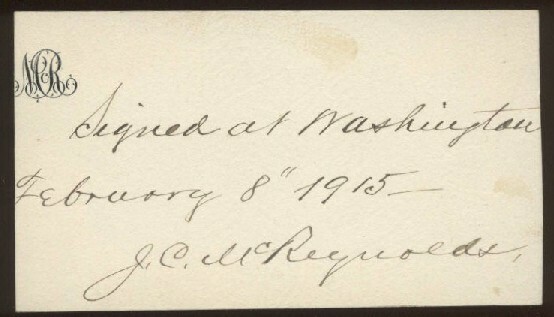 The card has McReynolds personal monogram in the top left corner and states both the date and place of signing.